The NCR System 3000 is a seven-level family of general-purpose, scalable, microprocessor-based computers that span a power range from 2.6 MIPS to more than 100,000 MIPS (millions of instructions per second) and are designed to address any computing level or task in business applications. System 3000 is based on Intel microprocessors and supports industry-standard operating systems: MSDOS®, MS-Windows, PenOS, MS-Windows for Pen Computing, PenPoint, OS/2, SCO Unix®, and Unix® System V Release 4.0. SCSI (Small Computer System Interface) is the common device interface supporting magnetic and optical disks, CD-ROMS, tapes, printers, and image drivers. The System 3000 supports an open Micro Channel bus for additional add-in controllers, The System 3000 includes mass storage subsystems based on RAID (Redundant Array of Inexpensive Disks) disk array technology to provide high performance and continuous data availability. Level 1 - System 3100 models include the 3120 Notebook and the 3125 Notepad. The 3120 Notebook model supports DOS, NCR Windows, and OS/2. The 3125 Notepad model supports PenOS, MS-Windows for Pen Computing, and PenPoint. Level 2 - System 3200 models are entry-level desktop computers, offering a broad performance range, yet packaged in a small-footprint cabinet to save valuable desk space. These models will support DOS, OS/2, SCO UNIX, and Unix System V Release 4.0. Level 3 - System 3300 models are powerful desktop systems, offering broad configurability and a wide range of performance, while still maintaining a footprint suitable for office environments. These models support DOS, OS/2, SCO Unix, and Unix System V Release 4.0. Level 4 - System 3400 models are the entry into scalable multiprocessing systems that use tightly-coupled microprocessor architecture. The single-processor models support DOS, OS/2, SCO UNIX, and UNiX System V Release 4.0. The multiple-processor model supports UNIX System V Release 4.0. Level 5 - System 3500 models offer mainframe-class reliability, data integrity, configurability, and performance with scalable, symmetric, tightly coupled multiprocessing. These models support UNIX System V Release 4.0. Level 6 - System 3600 models are the new successors to expensive mainframe clusters. Using loosely coupled parallel processing, these models are optimized for on-line transaction processing and decision support. These models support UNIX System V Release 4.0. Level 7 - System 3700 models offer enormous total performance. Configured with up to thousands of processors, these models will support the most demanding enterprise applications. Using loosely coupled parallel processing, these models are optimized for on-line transaction processing and decision support. These models will support UNIX System V Release 4.0. 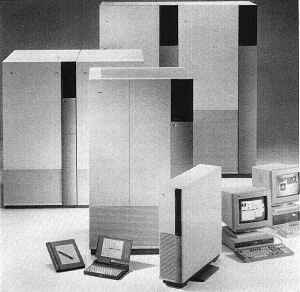 The NCR System 3000 family of computers is based on NCR’s strategy of Open Systems and Open, Cooperative Computing. Open Systems is defined as a set of standard relationships that enable different computers, subsystems, applications, and system software to operate together. Thus, the NCR System 3000 can be installed without removing all current hardware and starting over. The NCR System 3000 is based on industry standards, permitting its introduction into most computing environments and allowing a gradual transition to Open, Cooperative Computing (OCC). OCC gives users access to the applications and files distributed across a network of computers, allowing applications to be run anywhere on the network at the request of any authorized user in the network. Users authorized to do so may update files located anywhere in the network. OCC is based on the client-server model, which permits one program — the client — to obtain the services of another program — the server. Normally, a server serves multiple clients, and clients can access multiple servers. The client-server approach permits common application services to be concentrated in the server, placing processing power where it is needed to achieve a more cost-effective computing solution. Programs and data can be partitioned so that they are distributed across the network and throughout the enterprise. The client-server approach using open standards allows for a heterogeneous environment in which there is a maximum availability of software, and in which the equipment of multiple vendors can coexist. Relational and object-oriented data bases.